Buddhist temples in Thailand are known as "wats", from the Pāḷi vāṭa, meaning an enclosure. A temple has an enclosing wall that divides it from the secular world. Wat architecture has seen many changes in Thailand in the course of history. Although there are many differences in layout and style, they all adhere to the same principles. A Thai temple, with few exceptions, consists of two parts: the Phutthawat and the Sangkhawat. Chedi (Thai: เจดีย์) – also known as a stupa it is mostly seen in the form of a bell-shaped tower, often accessible and covered with gold leaf, containing a relic chamber. Prang (Thai: ปรางค์) – the Thai version of Khmer temple towers, mostly seen in temples from the Sukhothai and the Ayutthaya period. Ubosot or Bot (Thai: อุโบสถ or Thai: โบสถ์) – the ordination hall and most sacred area of a wat. Eight Sema stones (Bai Sema, Thai: ใบเสมา) mark the consecrated area. Wihan (Thai: วิหาร) – in Thai temples this designates a shrine hall that contains the principal Buddha images. It is the assembly hall where monks and laypeople congregate. Mondop (Thai: มณฑป) - A mondop is a specific square or cruciform based building or shrine, sometimes with a spired roof within a Thai Buddhist temple or temple complex. It is a ceremonial structural form that can be applied to several different kinds of buildings. It can house relics, sacred scriptures or act as a shrine. Unlike the mandapa of Khmer or Indian temple, which are part of a larger structure, the Thai mondop is a free-standing unit. Ho trai (Thai: หอไตร) – the temple library or scriptures depository houses the sacred Tipiṭaka scriptures. Sometimes they are built in the form of a mondop (Thai: พระมณฑป), a cubical-shaped building where the pyramidal roof is carried by columns. Sala (Thai: ศาลา) – an open pavilion providing shade and a place to rest. Sala kan parian (Thai: ศาลาการเปรียญ) – a large, open hall where laity can hear sermons or receive religious education. It literally means "hall, in which monks study for their Parian exam" and is used for saying afternoon prayers. Ho rakhang (Thai: หอระฆัง) – the bell tower is used for waking the monks and to announce the morning and evening ceremonies. Phra rabiang (Thai: พระระเบียง) – a peristyle is sometimes built around the sacred inner area as a cloister. Additional buildings can also be found inside the Phuttawat area, depending on local needs, such as a crematorium or a school. The buildings are often adorned with elements such as chofas. 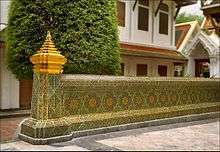 In temples of the Rattanakosin era, such as Wat Pho and Wat Ratchabophit, the ubosot can be contained within a (low) inner wall called a Kamphaeng Kaeo (Thai: กำแพงแก้ว), which translates to "crystal wall". Kuti (Thai: กุฏิ) – originally a small structure, built on stilts, designed to house a monk, with its proper size defined in the Sangkhathiset, rule 6, to be 12 by 7 kheup (4.013 by 2.343 meters). Modern kutis take on the shape of an apartment building with small rooms for the monks. The sangkhawat can also contain the 'Ho rakhang' (bell tower) and even the 'Sala Kan Parian' (sermon hall). It will house most of the functional buildings such as a kitchen building where food can be prepared by laity, and sanitary buildings. Multiple roof tiers are important element of the Thai temple. The use of ornamented multiple tiers is reserved for roofs on temples, palaces and important public buildings. Two or three tiers are most often used, but some royal temples have four. The use of multiple roof tiers is more aesthetic than functional. Because temple halls are large,their roof areas are massive.To lighten up the roof's appearance, the lowest tier is the largest, with a smaller middle layer and the smallest roof on top. Multiple breaks in each roof lighten it further – a double-tiered roof might have 2-4 breaks in each tier. Dynamic visual rhythms are created by these multiple tiers, breaks and tier patterns. In northern temples, the roof area is larger, sweeping low towards the ground to cover more of the wall. The lower tiers telescope farther to the entrance.In central Thai temple, the lower tiers telescope just a short distance beyond the top roof at the gable ends. 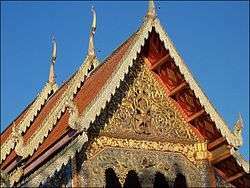 Most decorations are attached to the bargeboard, the long, thin panel on the edge of the roof at the gable ends.The decorative structure is called the lamyong. The lamyong is sculpted in an undulating, serpentine nag sadung shape evoking the nāga. Its blade-like projection called bai raka suggest both naga fins and the feathers of Garuda. Its lower finial is called a hang hong, which usually takes the form of a naga's head turned up and facing away from the roof. The naga head may be styled in flame-like kranok motifs and may have multiple heads. A roof with multiple breaks or tiers has identical hang hong finials at the bottom of each section. Perched on the peak of the lamyong is the large curving ornament called a chofah, which resembles the beak of a bird, perhaps representing Garuda. During the 10th century, Thai Theravada Buddhism and Hindu cultures merged, and Hindu elements were introduced into Thai iconography. Popular figures include the four-armed figure of Vishnu; the garuda (half man, half bird); the eight-armed Shiva; elephant-headed Ganesh; the nāga, which appears as a snake, dragon or cobra; and the ghost-banishing giant Yaksha. Wikimedia Commons has media related to Buddhist temple architecture of Thailand.